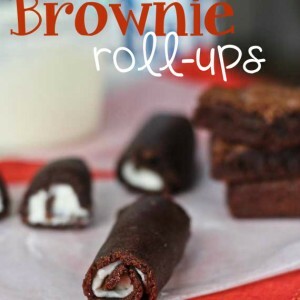 Brownie Roll-Ups - even better than the swiss rolls you had as a kid. Line a 9x13 baking pan with aluminum foil and spray generously with cooking spray. Cream butter and shortening together until smooth, approx 3 minutes using a paddle attachment. Slowly add sugar, once all added crank up speed on mixer to med- high and whip it up for approx 1 min. Add milk, depending on your liking: stiffer~ less milk, creamier ~ more. If you add too much, no worries, just sift in a little more sugar. Place a single brownie in between two sheets of wax paper and roll it until it’s thin. Then spread a thin layer of frosting on top of the thin brownie. Now carefully roll it up. I pushed with the wax paper as I rolled so the brownie wouldn’t break.